Our stay on the island of VIS (in Dalmatia, Croatia) started with a bottle of red wine from the Plavac grape variety, typical of this island, that the owner of the apartment brought as a welcome gift. A light in Lucio’s eyes twinkled, because we had agreed to abstain from any form of alcohol during your stay. Of course, you could not say no to this gesture, so he tasted it and I decided to find a way to use it in a recipe so he would not drink too much. (I realize that this reasoning may sound ridiculous for a single bottle of wine, but sometimes I am a bit of a fundamentalist. 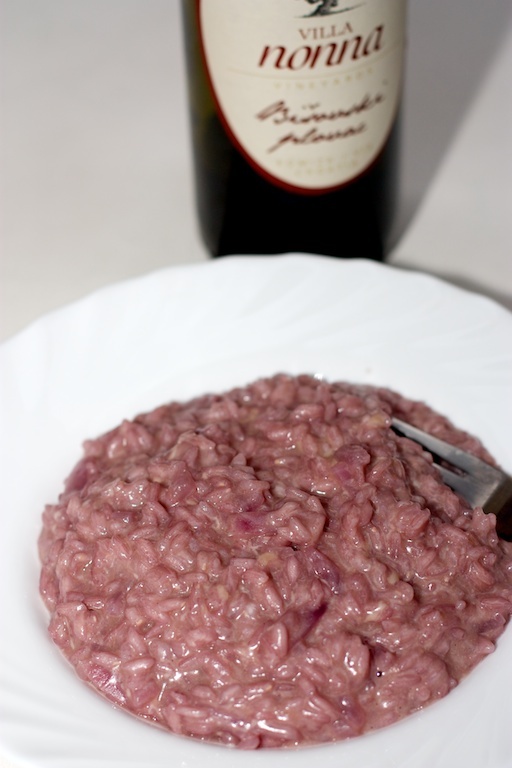 Since Lucio likes risotto so much, I thought I’d use it and try a red wine risotto. The result was positive and so he forgave me for having used his bottle. This wine is full-bodied, aromatic wine, with an alcohol content of around 15°. You can use a Barolo wine, or a Sardinian wine, or another with similar characteristics. In a saucepan, pour the olive oil, chopped onion and salt. Sauté the onion over low heat for 5 minutes. Pour in the rice and cook for a few minutes, then pour a little wine, stir, add more wine (only when the previous has been absorbed), proceed until the bottle is finished. Continue then adding boiling water, always little at a time and when the previous liquid has been absorbed. After about 20 minutes the rice is cooked. Turn off the heat, add the butter and grated cheese. Allow to thicken a few minutes and serve.